This paper was laminated which probably kept it intact (browning wood pulp paper, color correction during scanning makes it look about as good as new). Full article continued on another page that wasn't included with this one but this stands nicely on its own. 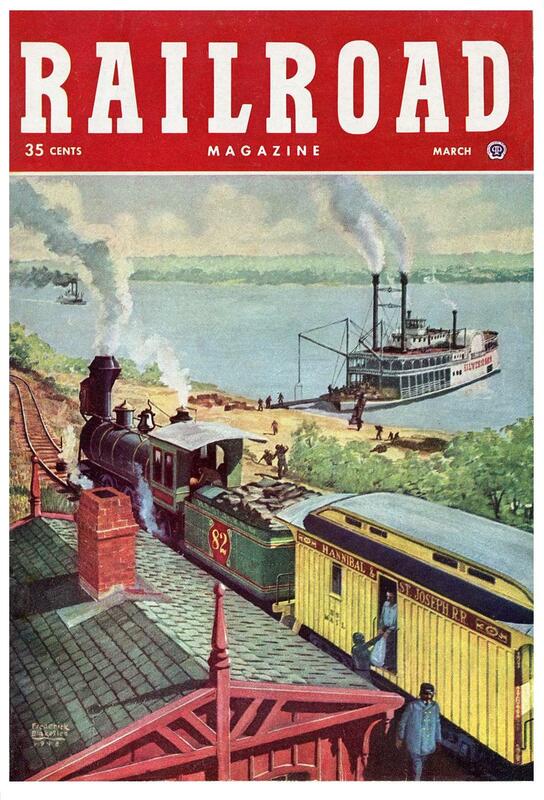 This is a scan of the cover of the March 1949 issue of RAILROAD MAGAZINE by Frederick Blakeslee (same artist who created the dust jacket for OLD FATHER OF WATERS). The cover art was entitled "First Run on the Old 'St. Joe' (Burlington)," so I gather the scene is intended to represent the shore of the Mississippi River at Burlington, Iowa. This same issue of RAILROAD MAGAZINE contains an article called "Burlington Route 1849 - 1949 A Photo Story," pages 12 to 43. The very first mail car ever built was constructed in Hannibal, Missouri for the HANNIBAL & ST. JOSEPH RAILROAD in 1862. (Note the name of that railroad is on the mail car). The name of the steamboat at the landing appears to begins with "SILVER" but the rest of the name is indecipherable. Two possible candidates for what Blakeslee intended as the name of the boat are SILVER LAKE which operated during the 1860's and SILVER MOON which operated from the 1850's to 1869. You're probably familiar with this . . . Pilot house of the Great Republic from Oct 1874 Scribner's Monthly from a series of articles about "The Great South", this was called Down the Mississippi. Original Mel Crair portrait, front cover of the Newsweek May 2, 1960, for which it was painted. 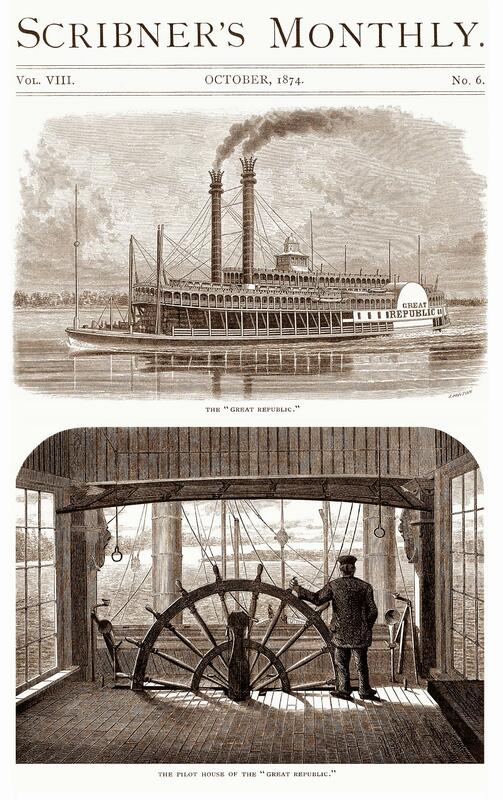 See more Currier & Ives steamboat illustrations - click here. 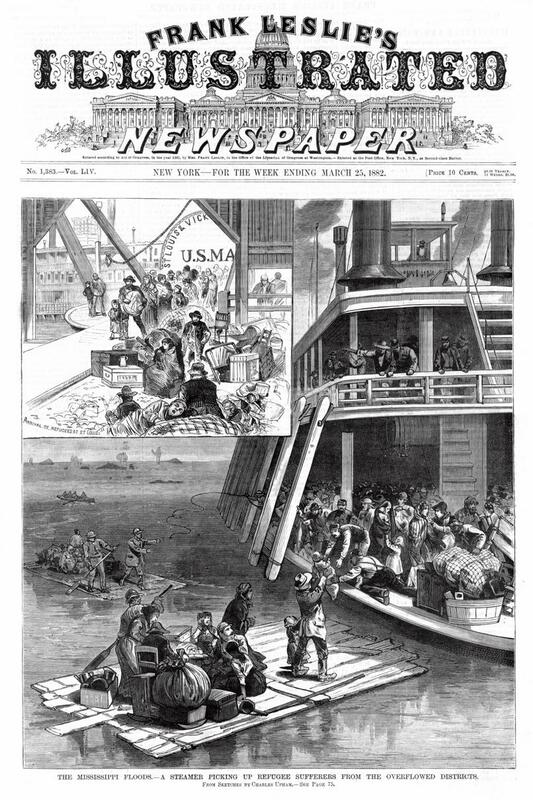 Prints published after the Civil War as reference for the steamboats and Mississippi River for his Mark Twain portrait. 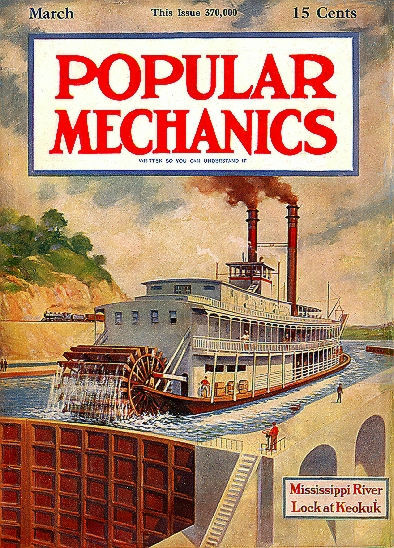 Old Popular Mechanics magazine cover, March 1913, documents the opening of the lock and dam in 1913. Illustrator John Atherton's cover painting of the TOM GREENE for the Saturday Evening Post Sept. 21st, 1946. NATCHEZ at a landing 1872. Style is reminiscent of N.C. Wyeth's but I don't see any artist's name on it. Fun old nostalgia. 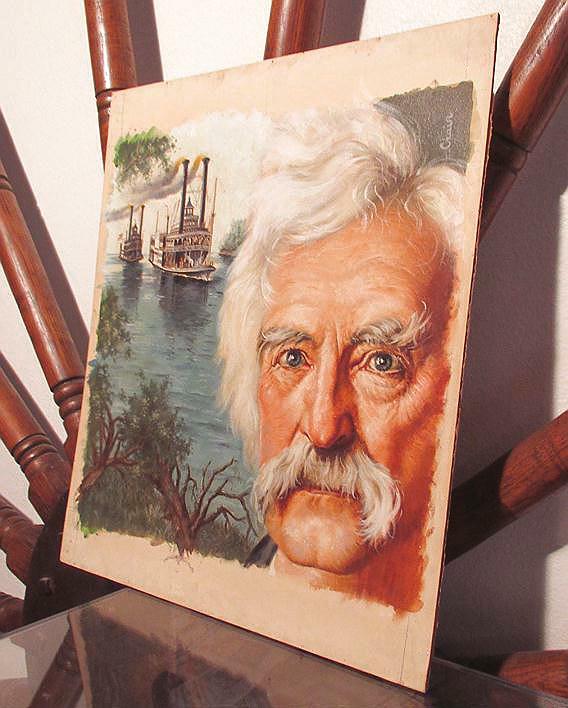 As a member of the Society of Illustrators, just wanted to let you know about a 'Steamboat' painting you had on your website. You said it was similar in style to N. C. Wyeth. If you look carefully, you can see the signature of W. J. Aylward on the right hand side, about a third of the way up on near the edge. It's partially obscured by age and/ or flaking paint at the edges. In my opinion Aylward was a phenomenal marine artist. He studied with Howard Pyle and was a friend of N.C. Wyeth. My friend Doug Allen, who wrote the book ' N. C. Wyeth' A Collection of Paintings etc.' had studied with Mr. Aylward in New Jersey. If you do 'Google images' you'll see other fine examples of the exciting paintings of W. J. Aylward. While browsing my scans I realized that W.J. 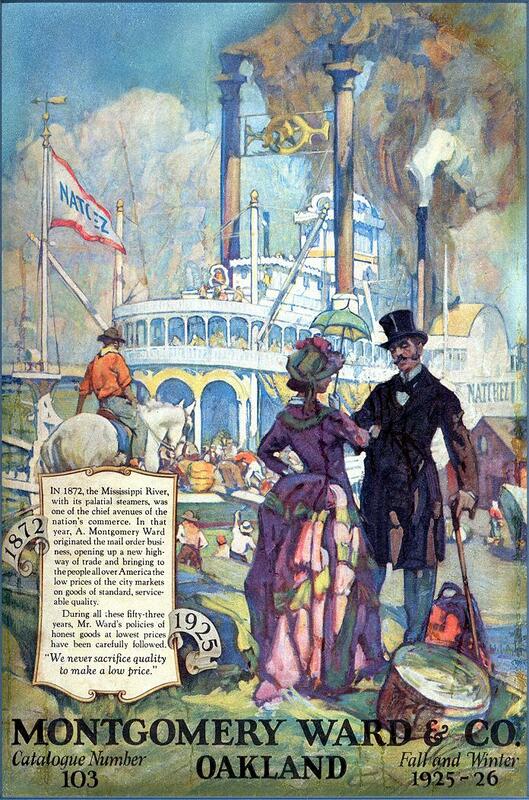 Aylward illustration for his own article "Steamboating Through Dixie" for HARPER's MONTHLY Sept. 1915 provided the inspiration for Aylward's own cover for the 1925-26 Montgomery Ward Catalogue. The artist/designer Mr. Watson "goofed" on the spelling of the novel THE GILDED AGE, he spelled it "The GUILDED Age" so I corrected that mistake and have attached the revised/corrected file. 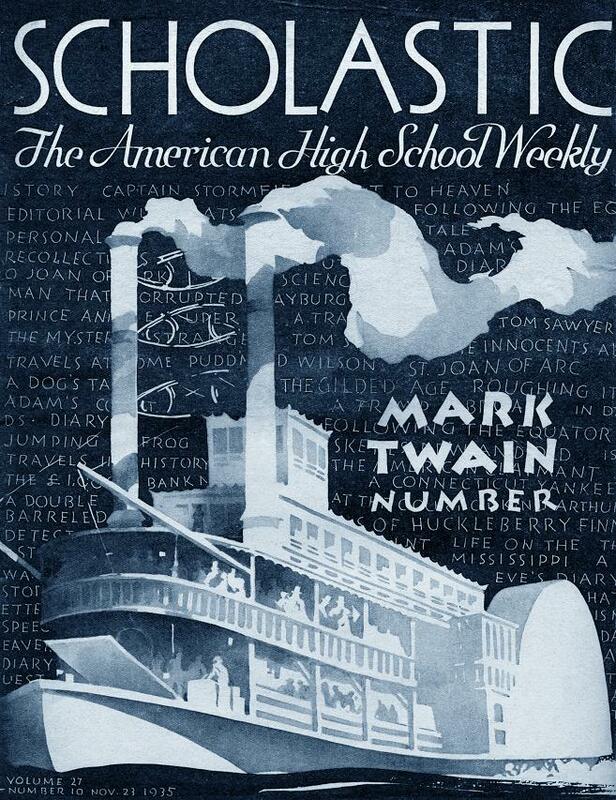 For the 1935 centennial of Mark Twain's birth (November 30), the November 23 issue of SCHOLASTIC "The American High School Weekly" was dedicated to MARK TWAIN with articles about Sam Clemens and excerpts from his writings. 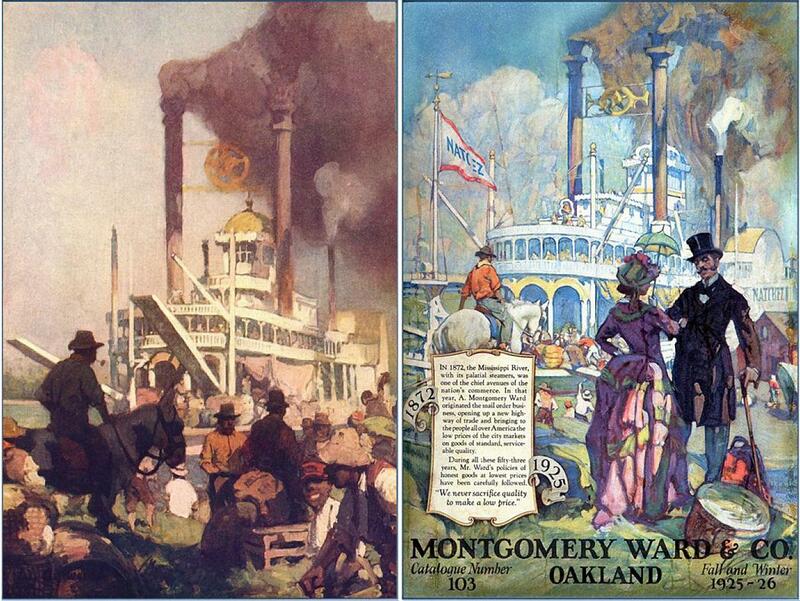 Ernest W. Watson designed the cover with a nice poster-style steamboat over a field of hand-lettered titles from stories, editorials, travel books and novels by Mr. Clemens. Graphic size on publiscation is 8.35 X 10.75 inches. 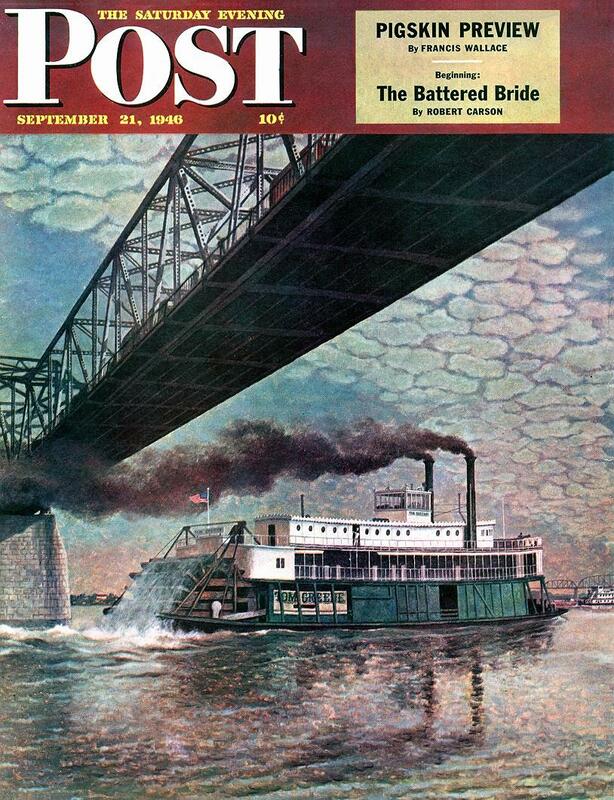 Attached scan of cover of wonderful publication by the Winona Steamboat Museum circa 1959 . . . the cover format is a "send-up" of National Geographic's magazine covers. 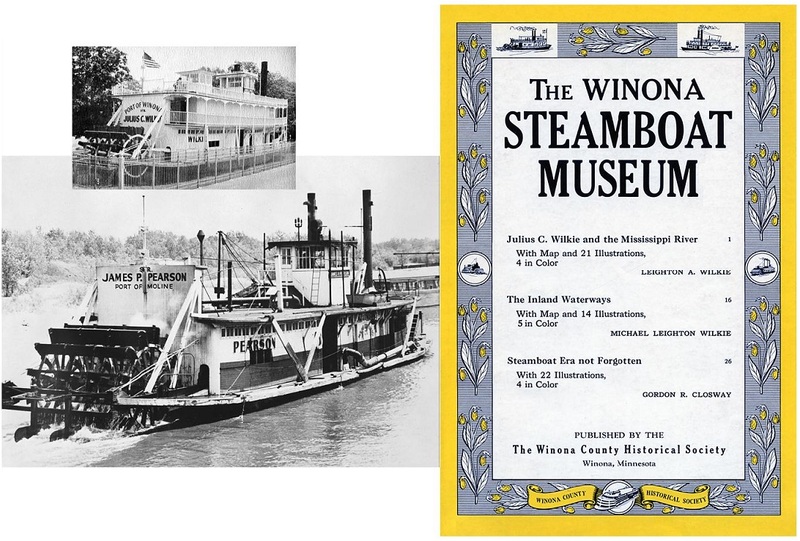 The towboat James P. Pearson (bottom left, credit MURPHY LIBRARY) was remodeled in rather corny fashion into the Julius C. Wilkie (upper left opening day dedication booklet) which was parked on a concrete platform near the Mississippi at Winona until it was dismantled in 2008 and the engines and paddlewheel ended up in North Carolina. The color photo (below) was taken by Dave Thomson in October, 2007. 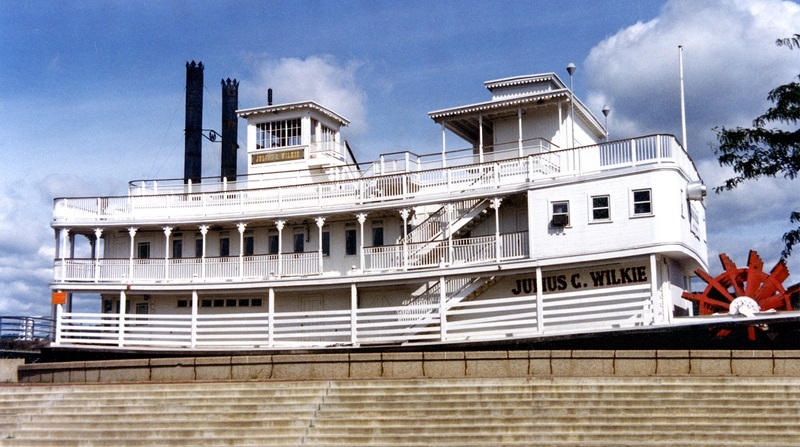 Although wags may brand the replica Julius C. Wilkie as Winona's "Boat that don't float", its predecessor had a reputation for being one of the busiest steamboats on the upper Mississippi River. The boat-shaped building that stands on its concrete foundation at the foot of Main Street is the third incarnation of a boat that began as a working river tug—the James P. Pearson. In 1936, the James P. Pearson Co., took a condemned 1898 vintage wooden hulled steamboat into their Rock Island, Ill., boatyard for refitting. A 10-man crew gave it new bow stems, new frames, new floor, an expanded cabin and a new Clinton steam engine, leaving in place the original boiler, pilot house, wheel, deck and engine room bells. Reconstruction lasted from the fall of 1936 to the spring of 1938, and by the start of the 1938 shipping season, the boat, rechristened the James P. Pearson II, was ready to begin operations, running six days a week, eight months a year, on the 289-mile stretch between Moline to Dozier Slough. During the '30s and '40s, the newly renovated steamboat's vigorous stride sent business soaring. As the years went by, that began to change, and by the mid-'50s the James P. Pearson II was practically a relic. Diesel engines were more economical than the old coal-burning steamers, and it became apparent that it was only a matter of time before the boat would be scrapped. The president of the Winona County Historical Society, Dr. Lewis Younger, learned the Pearson might be available. 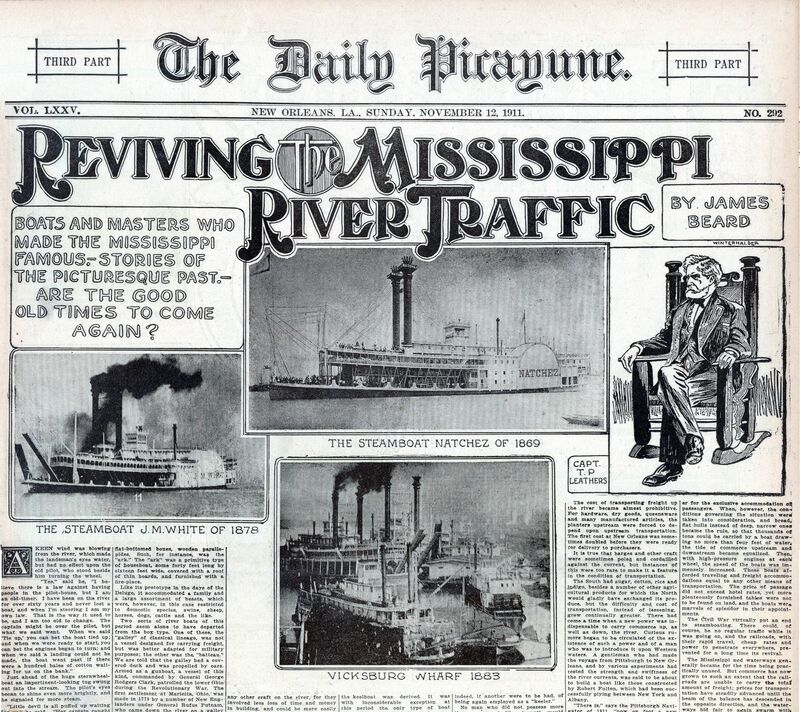 Aware of the boat's significance as the only woodenhulled steamboat still in existence, he orchestrated the acquisition of the Pearson by the society. In 1956, the boat moved upriver to Winona and was hauled ashore to be put on permanent display. The Wilkie Bros. Foundation of Des Plaines, Ill., funded complete refurbishment, including the addition of a second-level cabin row with a pilothouse on the very top. The remodeled workboat, now done up in gingerbread and foofraw, was renamed the Julius C. Wilkie in honor of its benefactor. The boat was operated as a steamboat museum, not only displaying the workings of a real riverboat but also housing a collection of riverboat memorabilia. In 1965, the old boat nearly took to the water again. Rising flood waters threatened to float the Wilkie off its foundations. It remained in place only after holes were cut in the hull, allowing it to flood. An uncontrollable fire leveled it the middle of the night. Arson was widely suspected and almost everyone seemed to be a suspect at one point or another: hitchhikers, workmen, even a Winona State students whose uncle—later accused of having "psychological issues"—sent a postcard to the police claiming he knew his nephew did it. Investigators later pinpointed the rear hull as the origin and followed the fire's path without finding any evidence to support the arson theory, and the case was closed. Winonans, undeterred, vowed not to be without a Wilkie for long. Less than seven months after the fire, supporters raised more than $200,000 to build a new boat - an outpouring of support that benefactor Leighton Wilkie dubbed "a miracle." Leighton Wilkie, whose family funded the restoration of the original Wilkie, donated $200,000 toward the new boat. The still-uncompleted structure opened March 4, 1983 to much fanfare. But despite sunny revenue projections, the boat lost money two of its first three years in operation - all while being managed by three different groups in its first four years. The third managerial group, Marlene Kohner and Carole Nelson, appeared to have the Wilkie on sound financial footing by 1988, when they predicted 10,000 visitors would tour the boat. The Wilkie's early demise was foreshadowed later that year, when Mayor Earl Laufenburger acknowledged the boat's roof had leaked "from Day One." A Wilkie board member acknowledged the boat's wood already was rotting - a situation he called "embarrassing." Then, in 1991, a 12-year-old Winona boy suffered minor injuries after falling from the Wilkie's second-story deck. The boy had been leaning on a rotting piece of railing that collapsed. The Wilkie's never-say-die supporters held telethons, auctions and other events to raise money for repairs. Things seemed to be looking up in 1991, when the city loaned $63,000 to the Wilkie Board of Directors to repair the boat. Then, in 1995, Winona businessman Paul Sweazey became chairman of the Wilkie board. Sweazey's secretive style alienated other board members and local leaders. By 2001, the Wilkie hosted just 1,700 visitors. The city deemed the structure unsafe in June 2006 and closed it to the public. The Wilkie's lease for its site in Levee Park expired in November 2006, triggering 18 months of debate over what to do with some of Winona's choicest real estate. The city council originally gave Wilkie supporters a year to raise the nearly $500,000 needed to repair and reopen the boat. But the council cut that effort short in summer 2007, and after months of waffling, finally voted to raze the boat in early 2008. On July 9 the boat-shaped building on the levee was reduced to kindling and hauled away. Just before the demolition, one of the Wilkie's most ardent supporters, Roxy Kohner, said the site was her personal place of reflection and solace. "You can sit there, and it transports you back to a simpler time," Kohner said. "You could be riding up the river without a care in the world." Portions of this story were first published Sept. 16, 2001, and July 9, 2009. Waterways Journal Ad 5 March 1955 Amerherst Barge Co. The company logo is accompanied by a hi contrast pen and ink graphic featuring a detail of a towboat that includes the pilot house and stacks with coal barges in the foreground. 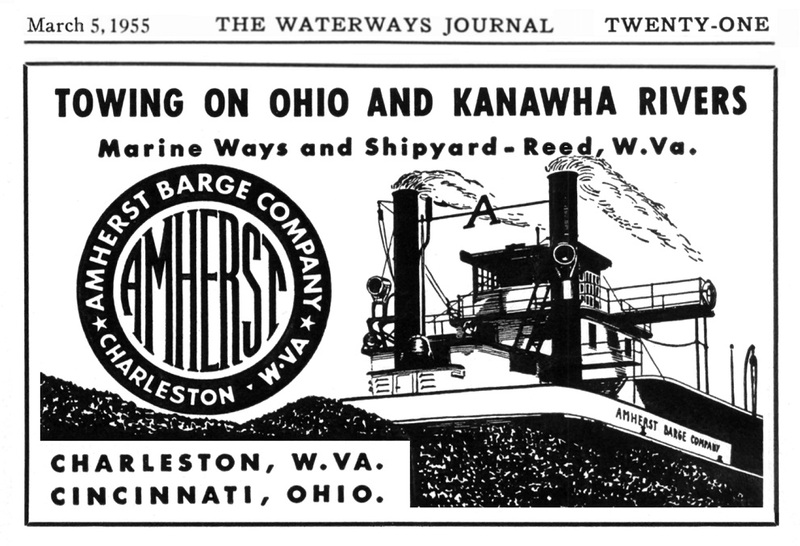 "AMHERST BARGE CO. OF CHARLESTON, WEST VIRGINIA & CINCINNATI, OHIO TOWING ON THE OHIO AND KANAWHA RIVERS Marine Ways and Shipyard - Reed, West Virginia." EXPLAIN HOW AMHERST BARGE CO. WAS ORGANIZED AS A SUBSIDIARY OF AMHERST COAL CO. AND CO-FINANCED BY THE COAL CO. AND LOGAN COUNTY COAL CORP. IN 1949. 1. Amherst Coal Company was incorporated in 1912 and Logan County Coal Corporation was incorporated in 1922. The companies were engaged in the business of producing and marketing coal from about ten mines located in the southern part of West Virginia. Amherst and Logan County were operated by substantially the same management but were not owned by the same interests in the same proportions. These two companies were merged December 31, 1951, with Logan County as the continuing corporation. Shortly thereafter, its name was changed to Amherst Coal Company (Amherst). 2. Amherst Fuel Company (Fuel Company) was organized in 1929 and has been a wholly owned subsidiary of Amherst Coal Company since May 31, 1952. It is the exclusive selling agency for Amherst as it was for Logan County and Amherst prior to their merger December 31, 1951.3. In order to enter the business of transporting their coal by river barges, Amherst and Logan County authorized on May 9, 1949, the acquisition of river loading and unloading sites, and river transportation equipment, at a cost not to exceed $1,500,000 to each company, and formation of a new corporation to carry out these plans. To this end, and on December 21, 1949, Amherst Barge Company was formed with a paid-in capital of $2,000,000, contributed in equal proportions by Amherst and Logan County. Upon the merger of Amherst and Logan County on December 31, 1951, the barge company became a wholly owned subsidiary of Amherst Coal Company. On October 17, 1960, its name was changed from Amherst Barge Company to Amherst Industries, Inc.